David Brazil’s new poetry collection Holy Ghost expresses the ideological cacophony of our times and juxtaposes it against the simplicity of human need. 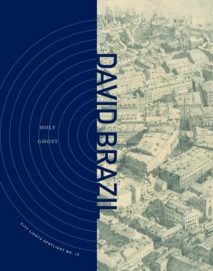 Brazil drops Christian spirituality, progressive politics, and a yearning for human connection into a poetic blender and leaves the output a bit jumbled on the page. His thoughts here are like a spray of machine gun fire—chaotic, at times indiscriminate, but impossible to ignore. we are the same people. Prayer for the soul of David Brazil. “Prayer” sets the emotional tone for the book, though its earnest, direct approach is rarely revisited. In the hectic scattershot of the following pages, Brazil’s language vacillates between collaged word images that often only hint at meaning and poems that mimic the faith-based verses and hymns of another century, almost precious in their neat rhymes and steady rhythms. The former give the disorienting impression of tuning into the broadcast of public liberal discourse, a million answers to the question “What does our society need?” and not one solution. Brazil’s indictment of these talking points is found within the tonal fuzz of his language, the way true human connection is blockaded by sloganeering and peace is drowned under well-intentioned noise. Within this distortion—in which occasional misspellings are allowed to sit, as if highlighting the shameless and unrevised opinionating of the internet—moments of sincere searching and yearning can be found, brief clippings of truth. aid us through the strait. but you have to look hard amidst all the rubbishes. our dormancies . . .
Holy Ghost is a songbook of anti-classist marches, a ratatat book of hours for the disenfranchised, but it doesn’t offer its comforts easily, or with easily-quotable snippets. There is digging to be done here to unearth the fragile temple in the rubbish of incarnation. This entry was posted in Uncategorized and tagged Fall 2017 on October 30, 2017 by Kelly.